From the map on Catherine’s wall. I’ve heard it said that one completes one’s wine education with falling for Burgundy. Or devoting one’s every waking thought to Burgundy. Or something like that. And over the course of my wine education, I have (reluctantly) come to agree that pinot noir’s best expression is in the myriad AOC’s, crus, plots, and subplots of Burgundy. Not California, not Italy, not Germany, not the Loire. 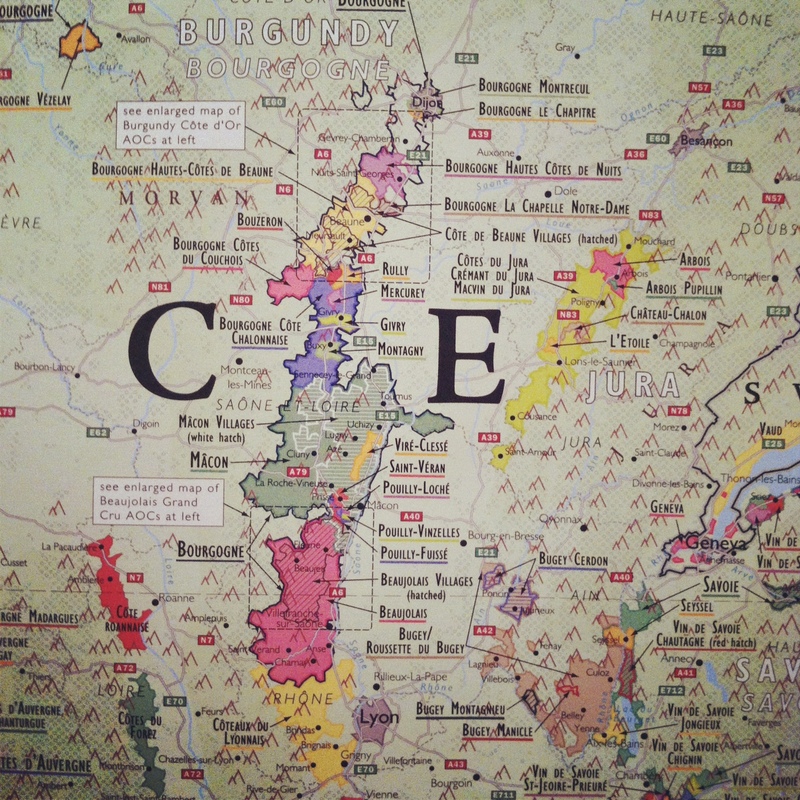 But there’s something impenetrable about navigating Burgundy, and this has always bothered me. It is said that every postage-stamp plot of land in Burgundy has a different character; and that the long-held, the swapped, the shared, and the dearly purchased plots have acquired a taxonomy that goes back centuries, even while evolving almost daily. Throw in the negociants, the recoltants, and all the famous houses who trade vignerons like it’s Major League Baseball, and you’ve got a lot of knowing to do. So, naturally, when I was studying for my sommelier’s exam, I blew it off. There are lots of other wines to know about in the world, even in France; I picked my battles, left a sizable chunk of the exam blank, and decided to learn Burgundy on my own time (I passed my exam, but only barely). I joined a Burgundy tasting group last fall in the hope of catching up. One can’t, after all, claim to know about wine and be so ignorant of all this. And as I hunkered down in our first meeting, with what was described as an attempt to better know a much-maligned vintage of a great wine (2007 Volnay), I had a million questions. About soil, aspect, rainfall. About cellar practices and AOC rules. What I got, though, was a lot of talk about the producers – about who was working for whom, where they had been working before, and from whom they were buying their fruit. Not a word about the winemaking, only about the winemaker. I asked about requirements for yields, ripeness, and cellaring, but was told that French wine law had none. (Can this be? It’s definitely not true of Spain, Italy, or Germany.) I asked about the soil composition in this plot versus that one, so we pulled out The Wines of Burgundy and looked up Volnay. But we never really got an answer. I work in Italian wine, mostly; and there, the discussion is all about viticulture and vinification. It’s all we talk about in our weekly meetings, and we talk avidly about it. It’s engrossing, lively, and challenging. Why was this not happening in my Burgundy group? I attended a (remarkable) Burgundy tasting at a very studious wine bar last week and it was the same story. Lots of names, but little technique. in fact, when the question came up whether or not a particular Chablis producer used wood in the cellar (they plainly did – it was right in the nose), the distributor said no. Then he changed his answer and said actually, yes. And it’s not so much that he didn’t know, but that it didn’t seem to matter. To anybody but me. My friend Beth Baye, who knows Burgundy much more intimately than I do, and loves it (and studies it) with a passion I can’t match, has always said about it, “you really have to know the producer.” That is, you can’t just study up on the good crus, good vintages, the vagaries of French wine laws, and then march confidently into your wine store and say, “This 2004 Chambolle-Musigny will surely be worth the $55 I’m about to spend.” The prices are high enough that experimentation is utterly discouraged, yet the whole world also seems to agree that to get something worth the price, there are a lot of things that “you just have to know.” I think that’s a huge problem with Burgundy. It keeps beautiful wines out of the hands of those who would otherwise love them the most.